Endeavour is a beautiful wordpress theme that comes with several shortcodes to create great looking web pages. This theme is awesome when viewing it on mobile phones or tablets and also comes with touchscreen support. Endeavour features a page builder that will make managing and sorting your page’s very easy. A clean options panel to edit your website and help you make your website look the way you want it to look and feel. 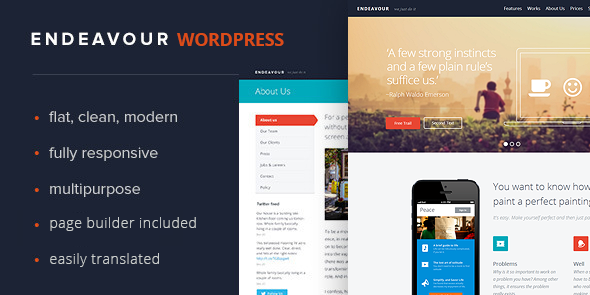 Endeavour is perfect for any business, agency or corporate website have fun creating a great looking website using this great theme!